Will your location be in compliance with the new rules? This is intended for people who already have a basic understanding of the confined space rules for general industry (§1910.146) and are curious about the added requirements (none were taken away) that will apply to construction activities. As we go through this, you may find it handy to have a copy of the new standard, Confined Spaces in Construction, available. You can download it here. So here are the main ways in which the construction standard deviates from the general industry standard. Most of these changes are intended to reflect the dynamic nature of construction sites and the many types of relationships that the parties to the construction activities might have. Exceptions: The scope of the OSHA Confined Space Rules for Construction standard excludes excavations, underground construction, and diving so those activities don't have to reflect these requirements. However, if you are entering a permit space through an excavation, then you’d need to follow these rules in addition to the excavation rules. Competent Person: This role has been added and it is defined the same as in the other standards (i.e., someone who can identify confined space hazards and has the authority to eliminate them). Later in the standard the competent person is required to identify confined and permit spaces at the jobsite. I would think that a competent person would have skills similar to an entry supervisor but they may be dealing with other contractors on the jobsite so they should have some level of authority. Controlling Contractor: This is the entity responsible for all the construction at a job site. Early Warning System: These devices are used to warn entrants of impending engulfment hazard. So if water suddenly started flowing toward an occupied section of pipe, entrants would have time to escape. It might be an electronic device or a person who can alert the entrants. Entry Employer: This is the employer who assigns the entrants to work in the space. Host Employer: This entity owns or manages the property where the construction occurs. This can be contracted out to another party (e.g., to a controlling contractor) if the other party has been informed of the permit spaces and their hazards onsite. There can only be one host employer. Qualified Person: Similar to the definitions on other standards, this is defined as someone who has been trained or has a degree or certificate attesting that they can solve problems related to a project or operation. The qualifications would be determined by the type of project or operation you’re concerned with. Paragraphs (a) through (d) tell us that before beginning work on a jobsite each employer must have a competent person evaluate and identify all confined spaces that they will assign workers to enter to see if these are permit spaces. If they are, the controlling contractor is notified and steps are taken (e.g., signs posted) to prevent workers from going into these spaces. If workers will enter the spaces they must be trained and a written program developed. (e) Describes the process for reclassification which is similar to general industry requirements except that OSHA allows employers to eliminate the physical hazards and then use a blower to control the atmospheric hazards. So they have, in effect, combined paragraphs (c) (5) and (c) (7) of the general industry standard. The remainder of this section follows 1910.146 (the general industry standard) very closely. Paragraph (h) specifies how information about permit spaces is supposed to flow between the various entities involved in the project. OSHA requires host employers (those who own or manage the property) to provide permit space information (locations, hazards, etc.) to the controlling contractor, who then provides it to the entry employers. If multiple parties are going to enter the same space, they can’t make hazards that impact others, and the controlling contractor must be briefed on the hazards and abatement measures after each entry. If there’s no controlling contractor, these responsibilities fall on the host employer. How you’re going to prevent unauthorized entry. How you’ll evaluate the permit space hazards before anyone enters. 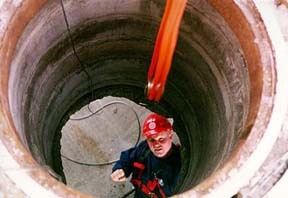 The means, procedures and practices required to ensure that the confined space is safe to enter. The equipment that will be provided to the entrants. Who has active roles (e.g., entrants, attendants, entry supervisors, etc.) and what their responsibilities entail. How you will rescue entrants in the event of an emergency. Procedures for issuing and cancelling entry permits. Procedures for reviewing the program on a regular basis. By and large these sections mirror the general industry standard very closely. In the training section they do specify providing training in a language and vocabulary the worker can understand, and the last section requires employers to make all documentation available to the Secretary of Labor (or their designee) upon request. Hopefully this post has provided you with some sense of how OSHA expects permit spaces on construction sites to be entered. The rules may seem a bit convoluted. But that may be the only way to assign responsibility among the many employers on a construction site. In any case, none of these rules change the simple fact that before you send someone into something, someone needs to find out if that space is dangerous, what work will be done on the space, and how the hazards will be managed. If you’re ever in doubt, refer back to the intent of the standard and try to fulfill that. In this case the intent is to ensure that anyone who goes into something to work, comes out healthy and if something goes wrong there are ways to deal with it. Achieving the intent of the standard is crucial. If you have any questions on this or other safety topics, feel free to contact us.